A Starfinder Society Scenario designed for levels 3–6. The PCs travel to the library world of Athaeum in search of answers to what happened during the Scoured Stars incident. The planet holds secrets thought to be lost to the rest of the galaxy and viciously guarded by its self-exiled extraplanar curators. A contingent of Hellknights from the Order of the Pyre joins the PCs in their travels to the library, but these Hellknights follow their own mysterious agenda. As the PCs receive special dispensation to investigate Athaeum's vast records, they learn the first truths of the Scoured Stars and take their first steps in unraveling what happened during the Society's greatest mishap. Content in In Pursuit of the Scoured Past also contributes to the ongoing goals of the Second Seekers (Luwazi Elsebo) faction. Content in this scenario also contributes to the ongoing year of the Scoured Stars storyline. Note: This product is part of the Starfinder Society Roleplaying Guild Scenario Subscription. Are there errors or omissions in this product information? Got corrections? Let us know at store@paizo.com. Sign in to create or edit a product review. First off, I love that this scenario involves the Hellknights Order of the Pyre! How can it go wrong? Right? This scenario is rife with wonderful roleplaying opportunities and a delightful cast of characters. All in all it was a fun scenario, and certainly unique. It's got some minor plot holes, but nothing a decent GM can't fix on the fly. A bigger downside is that it’s a relatively high-minded plot in this one, so if you’re just after a fun romp, or you’re playing alongside younger children, I would recommend selecting a different scenario. Good, but far from my favourite. I have only GMd this. A scenario with a good set up, good roleplay, and interesting enemies. There are however a few plot holes, some more noticably then others. And the map in the last encounter isnt entirely clear. The end fight however is really good, and people were sweating the outcome. They also had a lot of fun exploring the planet. So 4 stars. Good scenario, but a few blemishes that you can work around as a GM. SFS 1-11 is another really solid scenario. First, the generic goods, and then a few areas for improvement. The unique setting was really cool, and the first “encounter” on the ship was an exemplary way of giving characters an opportunity to share their backstory as a part of the story in an organized play environment, which almost never happens as a planned part of the scenario. Bravo! I also really liked how this scenario (finally, in my opinion) started to move the metaplot along. As two scenarios a month becomes the norm it probably won’t feel quite as long, but when this was released in late March it had been a full five months “real time” since we’d heard any more about Nominated First Seeker Luwazi Elsebo’s announced First Mandate. The encounters were also challenging, with the last one bringing in some unique environmental effects in what made for a really memorable encounter. as another review said, the cartography on this one, particularly for the last encounter, was a little bit lacking. As far as I could tell, based on the map provided, the only way to get down from the observation point into the actual library was through the small hole (leaving medium creatures out of luck unless the observation point was destroyed, which also destroyed any chance of using the fire suppressing systems. From reading through the scenario, it seemed like that area was supposed to be connected via halls or stairs to the lower library levels somehow, but I basically had to add a door/stairs in where I thought one should’ve been, based on the scenario text, rather than go only by the map provided. While it’s only one oversight, it’s kind of a big deal in that it directly affects how the PCs can/can’t engage with the scenario’s final encounter. from almost the very beginning the PCs had a pretty good idea the Hellknights were up to no good, but there’s no in-scenario way to prevent the library’s (near) destruction. It’s a little bit frustrating for players to “solve” the scenario on the ship but then be told not to worry about it until, gasp, suddenly the guardians need the PCs to worry about it. There were a few eye rolls as the PCs rushed to the next tower to confront the Hellknights, but maybe that was by design. 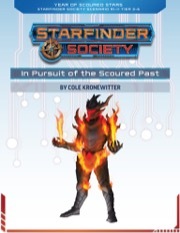 as another review mentioned, the question of how the Starfinder Society was going to use the “one copy only” information that they’d obtained without breaking the one copy only rule was a bit of a needless conundrum that the PCs were struggling with how to solve before it was handwaved away at the end of the scenario following circumstances none of the parties had foreseen. Literally a line or two in the scenario explanation saying the Starfinders had an almost unheard-of exception to the one copy only rule, but at an exceptionally great cost (which is then waved by defeating the Hellknights and everything works out), solves this issue. It’s the same scenario with the same premise, but PCs aren’t hung up on the one copy rule to the point that they’re discussing/asking Royo “if they remember something that they saw can they tell somebody about the memory or does that break the one copy rule and triggers the guardian’s interstellar assassins”, to which Royo stares blankly back, during the adventure. All in all, as a must play for characters going through the Scoured Stars arc, this is a scenario worthy of inclusion. Good stuff! I ran this at Subtier 3-4 using the four-player adjustment. In Pursuit of the Scoured Past is a solid scenario that has one great set-piece encounter. It incorporates a lot of interesting setting lore, contributes to the season-long plot, and makes excellent use of NPCs from past scenarios. Although the cartography needs work, it’s a very strong scenario that shouldn’t leave players disappointed. In Pursuit of the Scoured Past is an important scenario for the major “Year of the Scoured Stars” storyline that has been running through Season 1. In the adventure, the PCs are sent to a nomadic library world where they have to obtain information crucial to discovering how to breach the golden shield that has trapped so much of the Society in the Scoured Stars region. There’s some pretty cool stuff in the scenario, and, although it has some faults, for the most part it’s a worthwhile continuation of the storyline. The scenario starts, as they do, with a briefing by Luwazi Elsebo, the Society’s nominated First Seeker. She introduces Royo, a ysoki scholar and librarian that the players may remember from # 1-5 “The First Mandate.” Together, Luwazi and Royo explain about the library world of Athaeum: that it disappears and reappears in space in an unpredictable manner and is maintained by the mysterious Curators who place within its vaults only information that is unique in the universe (and who go to great lengths to make sure it becomes or stays that way)! The PCs are told they’ll be travelling to Athaeum with a member of AbadarCorp who has somehow made a connection with the Curators: an android named Iteration-177 (also introduced in # 1-5). The PCs’ goal is to learn whatever they can about the Scoured Stars and establish a positive relationship between the Society and the Curators for future research opportunities. From the start, it’s clear this is an important mission and it has an intriguing hook (a mobile library planet!). I really like how well the overseers of Season 1 have brought back and integrated key NPCs into subsequent sessions. Both Royo and Iteration-177 are memorable, and their presence makes earning those “High Society Influence” boons from # 1-5 worthwhile. During the journey to Atheaeum, one of my favourite events in the entire season (so far) takes place. It’s a very cool, original idea that cleverly gives players an opportunity to integrate their characters’ backstories into the session—something that can be *very* hard to do in normal organized play. It takes the form of a very unusual dinner party in which Iteration-177 explains he’s obtained a rare device called a pencibiter—a machine capable of transmuting memories into edible food for consumption that conveys those memories to whomever eats it. How this works in practice is that each player gets a chance to share a memory from their PC’s backstory with the others and convey the look, feel, and “taste” of that memory. Players who only show up for tactical combat may scoff, but Starfinder is a *role-playing game*, not just a miniatures skirmish game, and I loved the idea. More, the type of memory each player chooses has (unspecified) import for the future, as one of the boons on the Chronicles is tied to their selection. I would love to see other examples of ways to encourage the introduction of PC backstories appear in future scenarios. During the dinner party, the PCs realize they (and Royo) are not the only travellers that Iteration-177 is ferrying to Athaeum. A contingent of Hellknights are on board! The Hellknights belong to the Order of the Pyre, a group dedicated to the destruction of heretical works. Ostensibly, they’re journeying to Athaeum to ensure its defences are adequate, but I think you can guess that their presence on the mission is going to cause problems. Once the ship lands on Athaeum, the Starfinders meet one of the mysterious Curators. They’re told where they can obtain the information they seek, but that if the agents assist with some problems that have cropped up, the usually-exorbitant fees for research can be reduced or even waived. There are essentially three tasks that the PCs can undertake in any order in this part of the scenario. First, they need to destroy some security droids that have been infected with a virus that makes them hostile. The battle against the robots is pretty mundane, but what makes it exciting is that the PCs need to extract a copy of the virus from the robots and only have one chance to do so (with a few different means—and skills—potentially viable). Second, they need to placate or subdue a dangerous beast that has gotten loose from its cage (a ksarik) without killing it. Again, not the most original encounter, but it is a good test of the PCs’ ability to handle problems without murdering everything in their path. Third, and my favourite, is overcoming a “mindmaze” that contains the actual information on the Scoured Stars. This requires the PCs to enter a trance and send their minds into virtual representation of a maze, with successful Intelligence checks taking them closer to the center but failure inflicting Wisdom damage and making the DCs for all future Intelligence checks much harder. It’s a simple mechanism, but I thought it was quite flavourful and was a nice way to recognise the more cerebral PCs over the more brawny ones. In all these encounters, Royo’s presence is quite helpful to the Starfinders, and particularly so for any who have slotted his “High Society Influence” boon. It’s good to have friends in high places! The last part of the scenario triggers when the three encounters above are completed. The PCs receive an urgent request for assistance from the Curators because the Hellknights have started burning down one of the library vaults! After the PCs rush to the scene, they see a chaotic scene as Hellknights with flamethrowers systematically incinerate one-of-a-kind tomes. The battle against the Hellknights is made even more exciting by the presence of some unique elements. The encounter starts with the PCs in a control room that extends over the library, but it’s been weakened by the Hellknights and a single explosion (grenade!) will send the whole thing tumbling down. There are fire-suppression systems that PCs might be able to take advantage of in order to suppress some of the flames. But, the leader of the Hellknight incineration crew is a devil with the special ability to (quite literally) incinerate the limbs of a PC who gets too close! I was *really* hoping he’d get to use this ability on one of the PCs I ran it for because it would have been an awesome, “OMG!” moment, but alas my dice rolls didn’t cooperate. Anyway, it’s a tough battle but a fair one. The only thing I would have liked to see added was a mechanism for the fire to spread and a sort of “countdown timer” for failure. Senses of urgency are always good to add drama! One of the criticisms I do need to make of this scenario is the cartography. I rarely comment on the maps, but they’re really bad in this scenario. They’re either too plain and unclear about who starts where (the robot encounter), so small and basic as to be almost unworthy of inclusion (the ksarik encounter), or poorly laid out and described (the Hellknight encounter—specifically how the hallways on the side relate to the control room). Maps aside, the artwork (much of it recycled from past scenarios) is fine. The scenario concludes with the Curators thanking the PCs for their (presumed) assistance in (mostly) stopping the Hellknights. There’s an interesting reference to one of the Hellknights escaping with stolen material that I hope plants the seeds for a future mission. Speaking of plot seeds, the information that the PCs recovered on the Scoured Stars from the mindmaze is exactly that: a bit too complicated for me to get into here, but it essentially sets up the need for PCs to recover artifacts or relics scoured across the galaxy in order to lower the golden shield. Overall, I really liked In Search of the Scoured Stars. It’s a meaty scenario that has a lot going on, but is very satisfying both on its own and as part of the season story-arc. A couple of the encounters are a bit mundane and the maps need work, but in spite of that I’d definitely recommend it. This adventure, which continues the storyline begun in 1-05 The First Mandate, begins with a very unusual ceremony, allows the PCs to travel to a restricted planet, access privileged information, discover some unusual technologies and creatures, navigate an interesting enigma, learn more about the Scoured Stars incident and then foil the efforts of surprise enemies. The variety of experiences the PCs have is rich! The combats are tactically interesting. The finale combat presents both players and GMs with some intriguing decision-making, and potentially severe consequences, which heightens the quality of this adventure immensely. 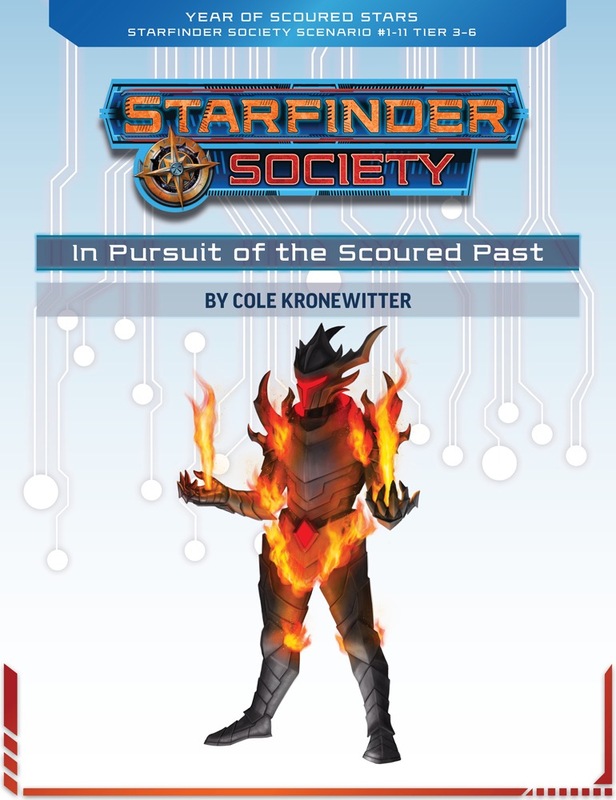 Setting up the planetary guardians to be imposing protectors of single copies of data is a very cool concept, but to then allow the Starfinder Society to have multiple copies of restricted data seems to undermine the guardian's mission, and is a strange exception to allow without a very good explanation. It makes one suspend disbelief. That's about it. This is exciting! I'm glad to see the Scoured Stars metaplot really coming to the fore. 2 people marked this as a favorite. A library world? Yeaaaaahhhh that's a bad idea, if I see a shadow moving on it's own, I make for the ship. Yup! Hellknights FTW! Woot Woot! 1 person marked this as a favorite. Wait wait wait. Order of the PYRE. In a library? Adds more fire extinguishers to the cart Points fingers to eyes, points to hellknights. A contingent of Hellknights from the Order of the Pyre joins the PCs in their travels to the library, but these Hellknights follow their own mysterious agenda. Three guesses what they're up to. 4 people marked this as a favorite. I'm currently wrapping up development on this, and hope to have the final map call outs soon. If you've been interested in the Scoured Stars metaplot, this is a scenario that starts really diving into exploring it. Similarly, this is a scenario that is setting up a LOT of material for us to mine for future scenarios. I think PCs (not to mention players) will get a huge kick out of this, especially from a lore perspective. I can has map spoiler? Can we have Maps for this Scenario please. Quick question, as I glance over the product description. I know the Order of the Pyre existed on Golarion, but I cant't find any reference to it in the Starfinder core rulebook. Is this an intentional introduction of a new minor hellknight order (well, new by the standards of SF) or something else? You're quite correct in your assumption. The Order of the Pyre exists in Starfinder, though to a bit of a less intense degree than Pathfinder. We thought it made sense to take an older order, which perfectly fit the theme we setup in this adventure, than try to give one of the newer orders a rushed introduction into an already plot-heavy scenario. I've ordered this and I can't download it. I volunteered to GM at a convention in 2 days time, and this scenario was allocated to me, so unfortunately this is kind of urgent now. I've also started a thread in customer service. I'm just hoping someone at Paizo takes notice. Scenarios typically drop the last Wednesday of the month. Check your downloads now. Mine is there. Just as a preliminary reminder—I'm not personally able to assist you with any website/tech problems—you'll find the customer service number at the bottom of each web page, including the hours the department is available to answer phones. If your message's timestamp is indicative of when you tried calling, you might have been calling before business hours. Is there supposed to be a "Faction Notes" section for this scenario? Hey! Who turned out the lights?! Want to post a reply? Sign in.